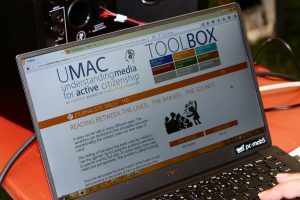 The UMAC partners felt this was a good opportunity to pilot some of the activities. 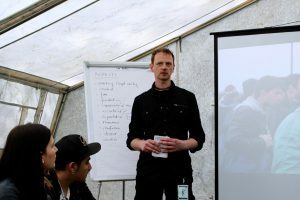 First, preparing a workshop with a trainer that hasn’t been directly involved directly with the project, to test the trainer interaction with the UMAC toolbox, Carsten Girke, an expert on corporate communications and media production. 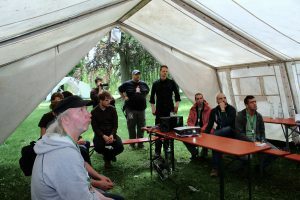 He has been working as a free journalist since 1995 and has been conducting the basic radio trainings at Freies Radio Wüste Welle for more than ten years now. Second, delivering the workshop to a group of participants, to test if the expected learning outcomes are achieved. We decided to use the activity Reading Between the Lines… the images… the sounds. This activity was chosen because we already knew we would have some media producers attending the training, but as it was open to the general public we had to select an activity that would be simple, entertaining, and as we might have to deal with different levels of journalistic skills, we decided to go with an activity that would be mostly about media analysis and self-awareness of our media habits. The training was delivered to a mixed group with participants from Germany, Spain and Finland. The workshop had three parts. Part 1 was dedicated to discussing the elements that the radio uses to create an atmosphere and to reflect on how music, tone, etc influence the tone of the content. Part 2. Participants discussed how personal perspectives influence the content of the report. We asked participants to break down into pairs and to put together a text that would describe the situation in a refugee camp in Greece from the point of view of refugees (a letter to their family), an NGO (report on the situation to the organisation headquarters), immigration police (reporting to their superiors), a news agency and politicians. The texts were read, and it was accepted that each report have some truth in it once the text was analysed and the context understood. Part 3 Focused on production within media constrains. The group was divided into smaller groups, and they were to prepare reports for different media: Al Jazeera, Reuters, Fox and Community Radio. Reports were read and there was a discussion about the economic and political interests that shape media reporting, as well as individuals ‘prejudice’ when approaching media _we all as individuals choose what media is more credible to us, but it is important to contrast information from different sources as a media consumer, but also as a media content producers. 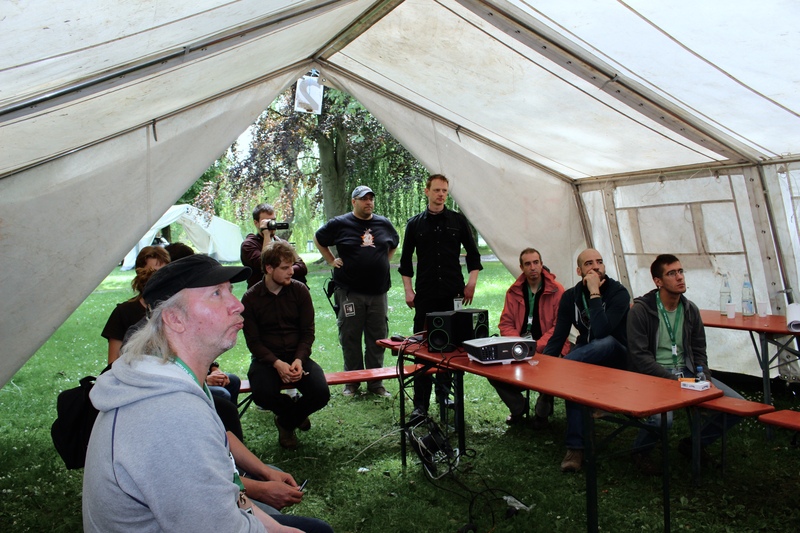 Then, at the end of the workshop there was a round of feedback. Participants in general found that the workshop was really enlightening for them as media producers. It made them aware of self-imposed limitations in the production of content, from source selection to news contextualisation. 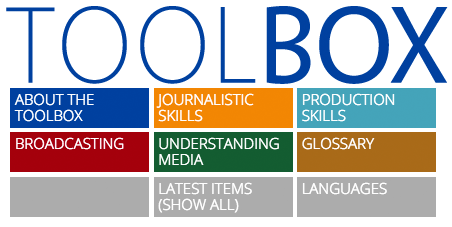 One of the participants, Eloy, is also a training with his organization and he requested a Spanish translation of the toolbox so it could be used for training by Spanish radio stations. 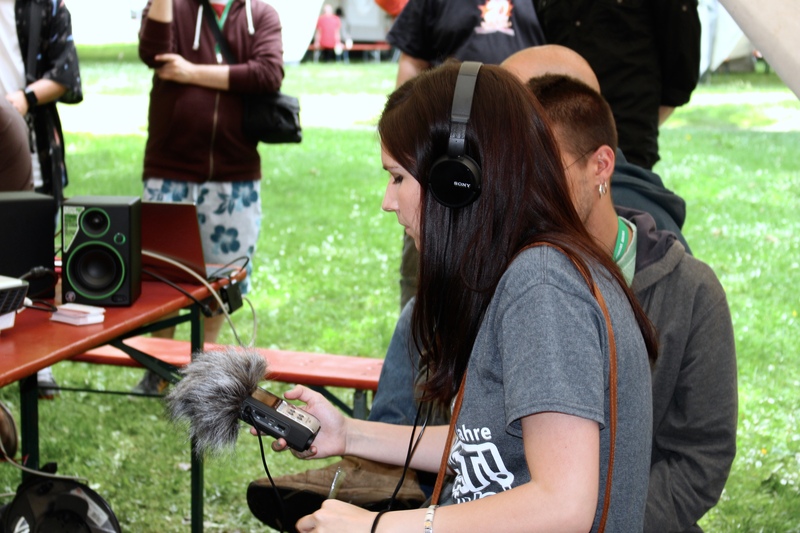 You can hear his opinion, plus those of the two trainers, Sally and Carsten, in an interview broadcast by Wueste Welle immediatly after the workshop.